Spam filtering tools work to detect and filter out spam. The changes you make to your spam filtering preferences will be in effect regardless of your email software; even if you use Outlook, Netscape Mail, Eudora, etc., your spam will be filtered, according to your preferences, before the email reaches your inbox. First login to your KloudEmail account using KloudEmail Webmail. This login is also visable from the KartHost.com home page via the LOGIN link, once on the Login page click the KloudEmail Webmail box. Access your KloudEmail Settings from the "hamburger menu" to the right of your email address in the header. Click on the "hamburger menu" and a drop down menu will appear, click on Settings. Select Spam Settings (1) from left column. Default tab (2) will be Preferences. Status - Turn spam filtering on, off, or set for exclusive. Note: Exclusive filtering will only allow incoming email from addresses or IPs on your Safelist. Deliver to the Spam folder - Spam emails will be deliveared to your Spam folder. Deliver to the email address - Spam emails will be forwarded to the email address you Indicate. Include [SPAM] at the beginning of the subject line - Spam emails will be deliveared to your Inbox, but will include text "[SPAM]" in the Subject line. 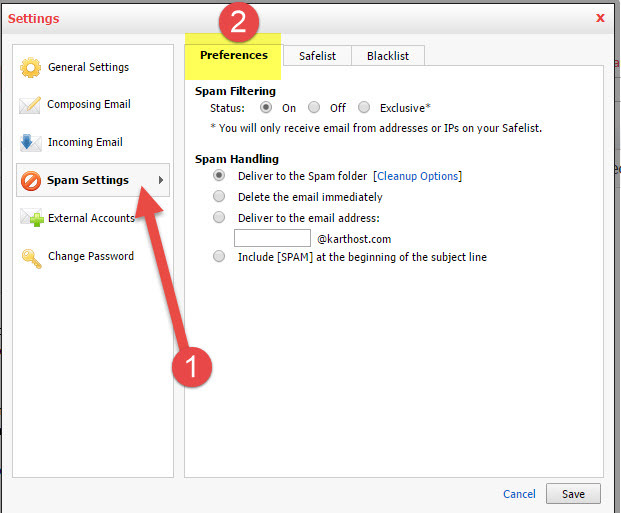 Click the Spam folder Cleanup Options link if you want to limit the mount of spam that is stoared in the folder. Iandicate how often your Spam folder should be purged automatically - fter specific number of dys or specific number of emails. Or, to turn off the automatic cleanup, select "Never automatically delete spam." Note: If you are using email software (Outlook, Netscape Mail, Eudora, etc.) with POP3 connection, you will need to log in to webmil to view your Spam folder. If you have your email software set up with IMAP, then you must sync the folder to your email manager software.